Humans have used whips for centuries for a variety of reasons. Whips range from long bullwhips that deliver a stinging bite to soft floggers often made of materials such as horse hair. A horse hair flogger can be made in a short time with just a few items. 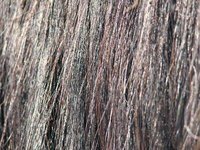 Lay your horse hair on a flat surface and comb it to remove any tangles. Pick up the hair after you've removed any knots and hold it in one hand, wrapping the rubber band around the middle of the hair to hold it together. Stand your wooden dowel up on one end, placing the horse hair on top of the free end with the rubber-banded center of the horse hair in the middle of the dowel. Staple the horse hair to the dowel, placing two staples in an X shape over the rubber band to keep the horse hair from coming loose. Pick up the dowel and spread a thin layer of glue over the bottom. Press the leather circle over the end of the dowel, folding the edges over the side of the handle and gluing them down. Allow the dowel to dry overnight. Add a layer of glue around the entire handle of your dowel, wrapping the thin strip of leather around the handle. Begin at the top, pressing the end of your leather strip into the glue, wrapping the leather strip around the handle toward the hair. Keep even tension on the leather so it wraps evenly around the handle without gaps. Apply a small amount of glue to the inch of hair closest to the handle and continue wrapping your leather around the hair. This will help add stability to the hair closest to the handle and will help prevent hairs from falling out of your flogger. Cut the excess leather off with your scissors and let the flogger air dry for at least 24 hours to set the glue before use. Always take care of both the leather and horse hair portions of your flogger. Wash the hair with shampoo just as you would your own hair, taking care not to wet handle. Rinse well and comb out any resulting tangles once the hair is dry. Wipe the leather down with leather cleaner once a week, rubbing it gently into the leather with a clean rag.